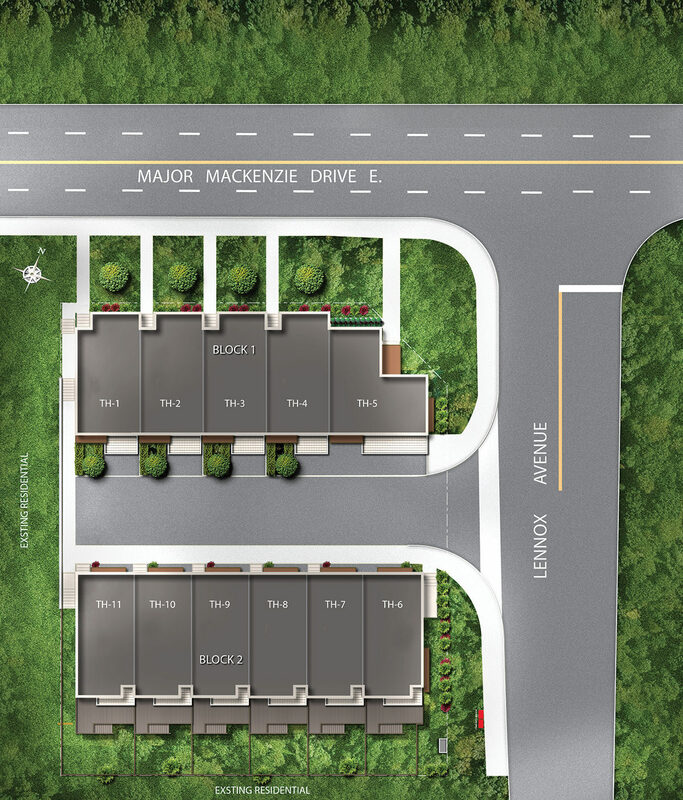 Richmond Towns is located at 219 and 227 Major Mackenzie Drive East in Richmond Hill. 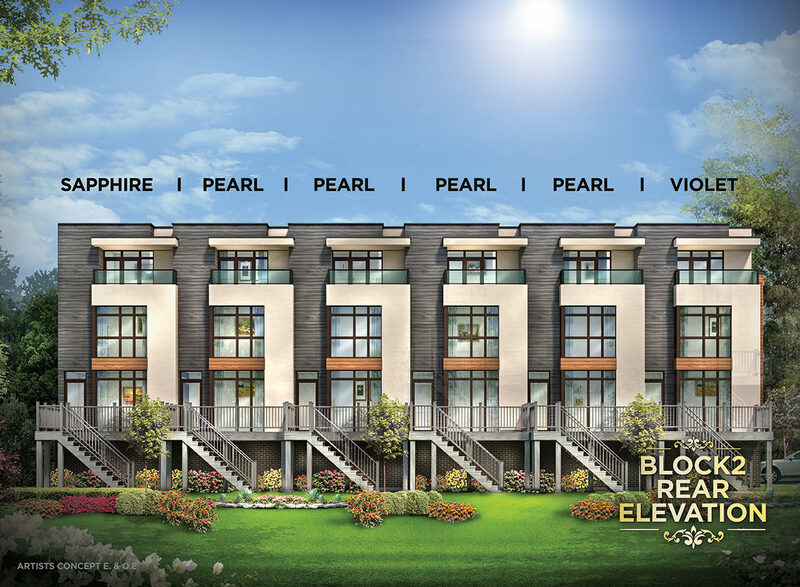 This enclave of modern townhomes is a 2-minute walk to the Richmond Hill GO Station, making it ideal for commuters and those who live Life on the Go. A public rapid transit system, right outside the community, is planned to open in 2021. 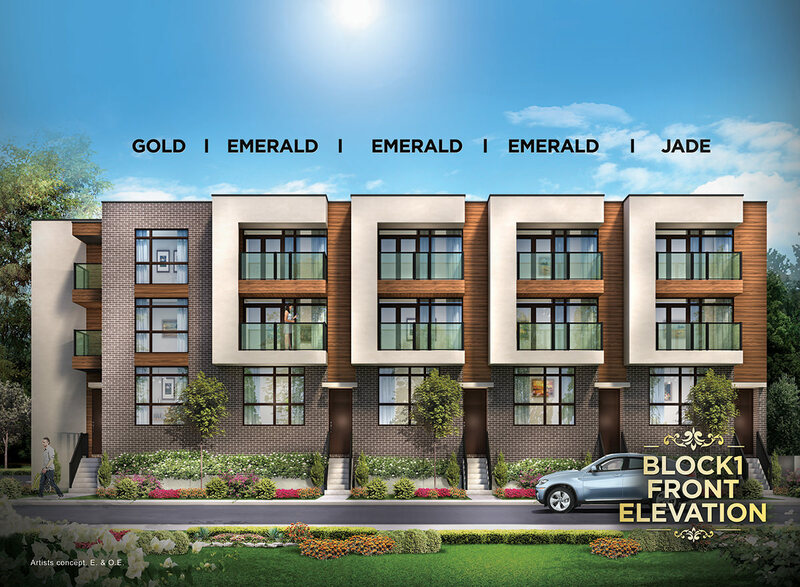 Meticulously designed by the Ideal Developments’ team, Richmond Towns offer a combination of brick, stucco and trim accent features. 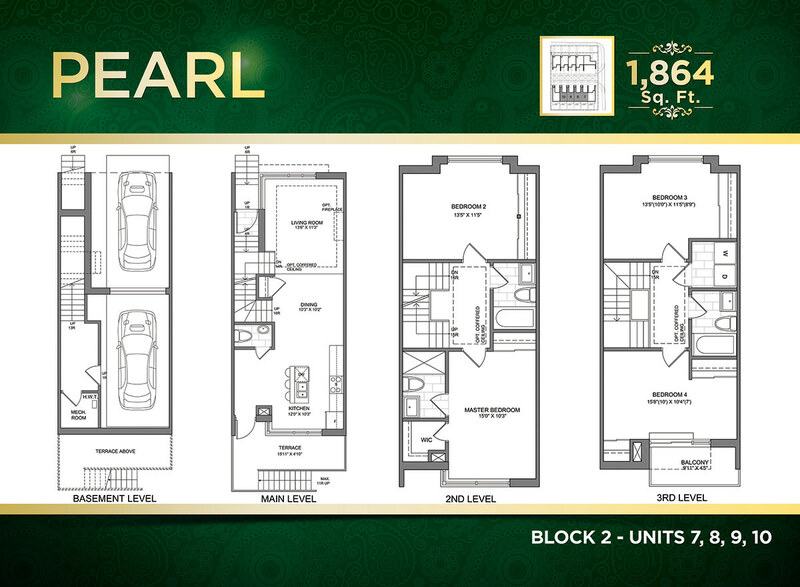 Interiors boast the pinnacle of style and elegance with spacious open-concept layouts and 9 ft. ceilings as well as a number of sustainable features that contribute to a healthy lifestyle and reduced monthly utility costs. Richmond Towns offer professionally designed gourmet kitchens that provide the ultimate culinary experience. 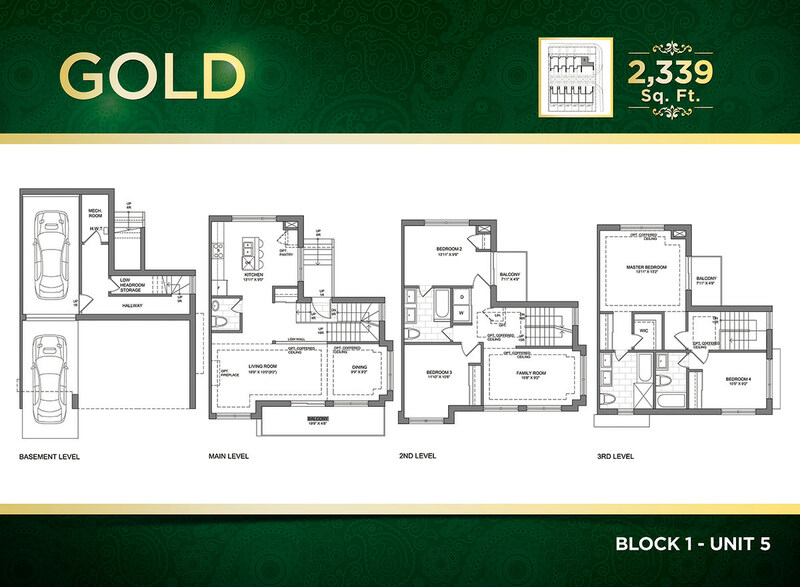 Kitchens feature stainless steel appliances, luxury granite countertops, designer backsplashes, and an extended kitchen island with breakfast bar – great for entertaining guests. Many of the homes have an expansive deck at the rear of the main level. 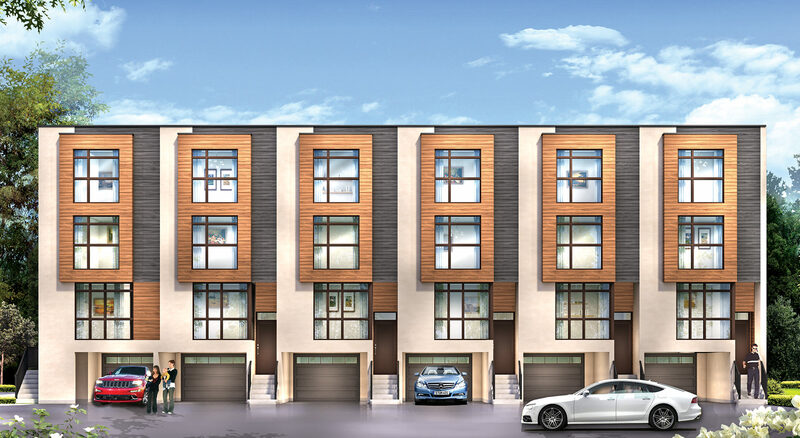 Richmond Towns offer four large bedrooms, luxurious master ensuites with frameless glass showers and double-vanity sinks and granite countertops. 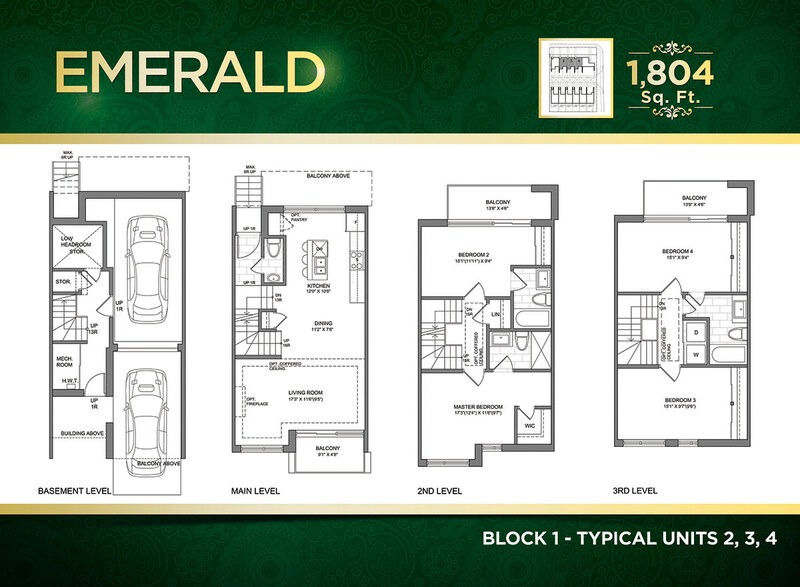 This enclave of 11 townhomes range from 1,800–2,345 sq. ft. in size and start in the mid-$800s. 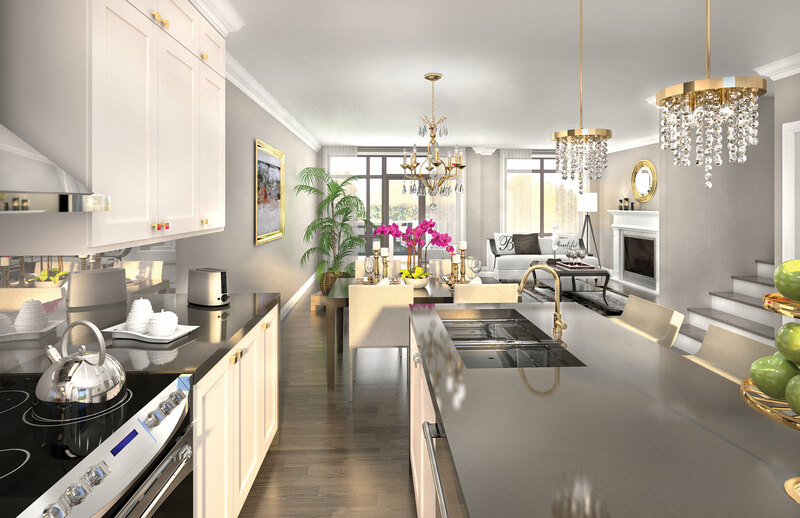 Richmond Towns by Ideal Developments offers an unparalleled combination of a highly desirable location, cutting edge design and forward thinking sustainability. 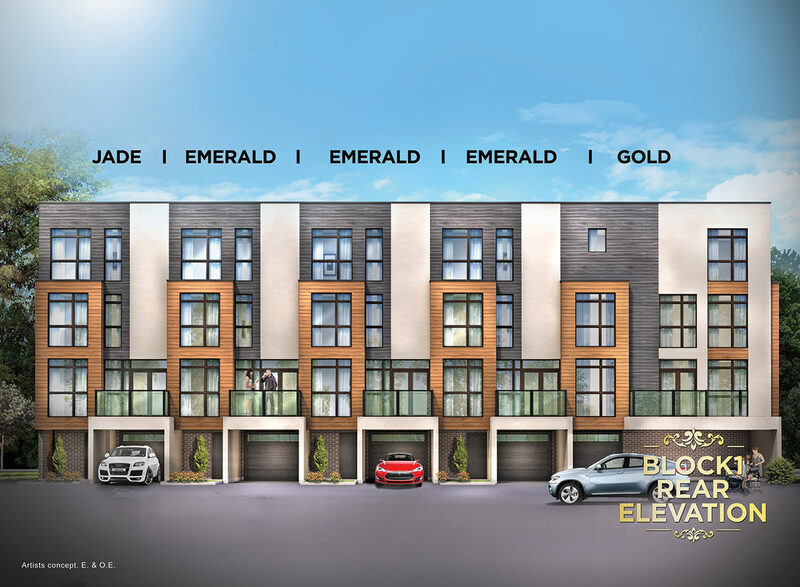 Architecturally controlled exterior colour schemes. 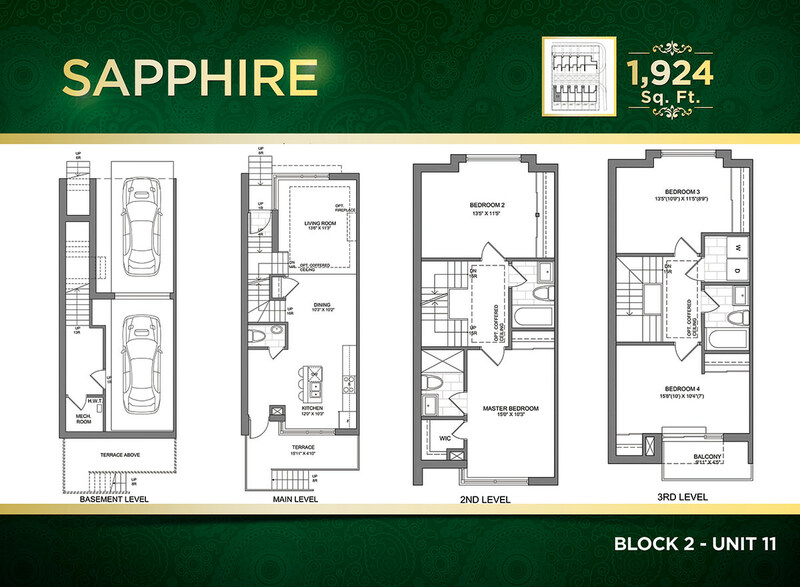 Gracious terraces and charming balconies (as per plan). 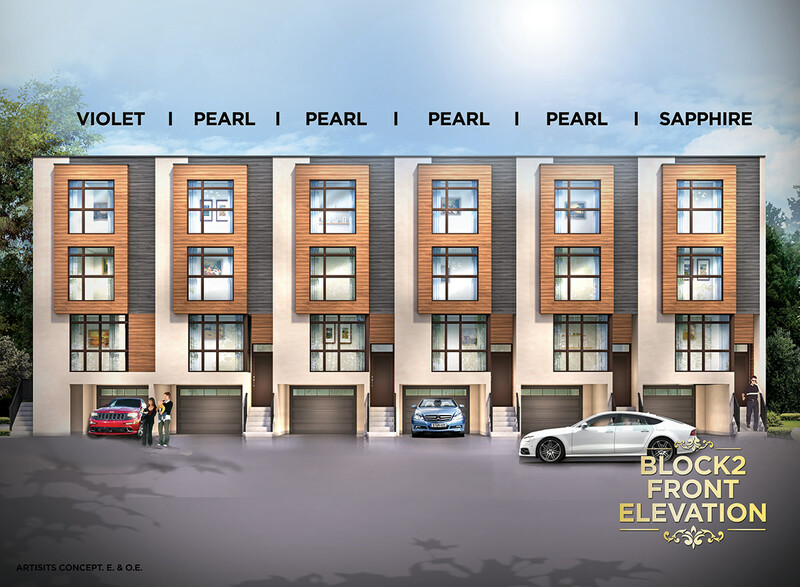 Modern architecturally designed homes with combinations of brick and stucco with coloured trim accent features, in selected locations (as per elevation). House address plaque to be installed onto front elevation. (one side only, per Vendor). Pre-finished aluminum soffits, fascia, eavestroughs and down spouts. Flat roofing system providing protection against water leakage and extreme weather conditions. Fully graded and sodded lot with precast concrete front, rear and side walkway (where applicable). Pre-finished sectional roll-up garage doors with decorative glazing and heavy duty springs. Fully paved driveway with base and top coat asphalt. Accessible balconies with black aluminum railing and glass insert. Block 2 rear deck to be stained pressure treated wood (as per plan). Tongue and groove sub-floors glued, nailed and screwed down to floor joist. 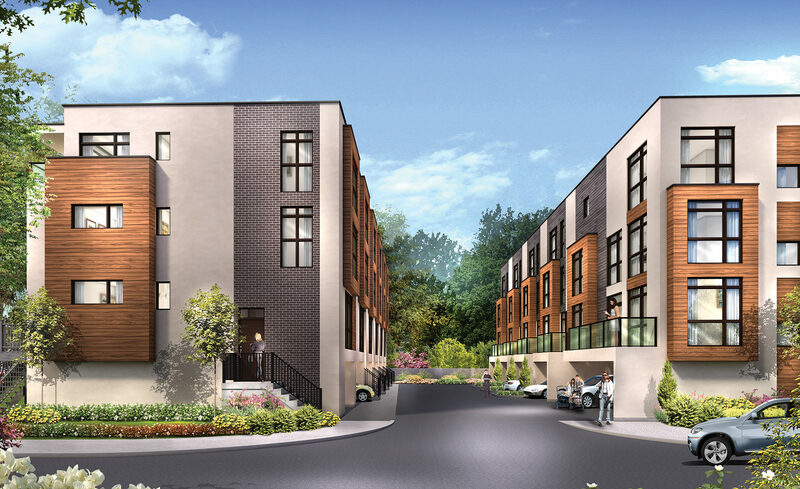 Townhomes have acoustically controlled party walls between units. Spray foam insulation in garage ceiling below liveable areas. Garage to be fully drywalled, taped & primed, and prime painted white colour-including ceiling, excluding exposed poured/block concrete. Air/vapour barrier applied to exterior walls. Air seal package to all exterior doors and windows. Continuous vapour barrier and draft-proof electrical boxes on all exterior walls for increased air tightness and energy conservation. 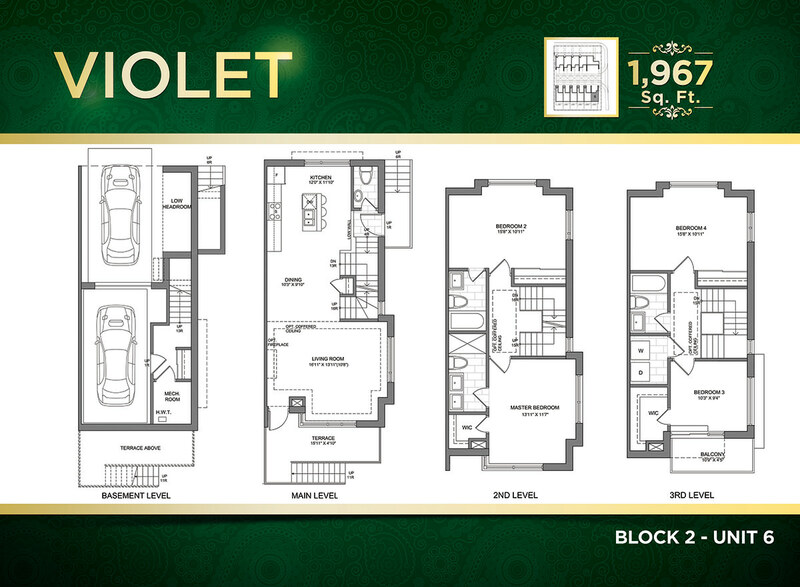 9' ft. ceiling heights on the main and second floor, third floor has 8'6" ceilings. Dropped ceilings and bulkheads over kitchen cabinets, laundry room and main bathrooms as required for structural and mechanical requirements (where applicable). Insulated metal entry access door from the garage to house (as per plan). Smooth finish ceilings in bathroom and laundry rooms. Spray texture ceiling on second and third floor with 4-inch smooth border excluding closets and coffered ceilings. Natural finish oak veneer stair with solid wood treads from the main to second and third floors (as applicable). Carpeted stair (40 oz.) with painted wood handrail/stringer from basement level to main level (as per plan). Wire shelving installed in all closets. Duct cleaning at time of occupancy. Custom designed kitchen cabinets in a wide choice of styles from Vendor's standard samples. Luxurious granite kitchen countertops from Vendor's standard samples. Backsplash from Vendor's standard samples. Extended depth fridge upper cabinet (as per plan). Double stainless steel undermount sink with pull out spray. Heavy-duty wiring and outlet for stove and electrical outlet for refrigerator. Quality bathroom cabinetry as per Vendor's standard samples. Laminate countertops as per Vendor's standard samples. Granite countertops installed in master ensuite with undermount sink. Single or double vanity with undermount sinks and single lever faucet(s) (as per plan). 2-piece powder room on main floor with pedestal sink, (as per plan). Bathrooms include 5' acrylic tub with full height ceramic wall tile or shower enclosure with full height ceramic wall and ceiling tiles from Vendor's samples, (as per plan). Separate frameless glass shower stall (as per plan) to include marble surround and light fixture. Cement board on shower enclosure wall(s). Classic white plumbing fixtures in bathroom(s) and main floor powder room. Bathroom accessories in all bathrooms to include toilet paper holder and towel holder (as per plan). Mirrors in all bathrooms with bevelled edge. Light fixture installed above mirror, as per Vendor's standard samples. Privacy lock on all bathroom and powder room doors. Upper laundry cabinets in white (as per plan). Faucets and separate drain for automatic washer. 12" x 24" ceramic floor tile per Vendor's standard samples. All upper floor laundry closets/rooms to include a floor drain (as per plan). Wiring and outside venting for dryer. Laminate flooring on main floor (except tiled areas, as per plan). Berber carpeting with 1/2" inch underpad from Vendor's standard samples on second and third floors. 12" x 24" ceramic or porcelain tile in foyer, kitchen and bathrooms/powder rooms (as per plan), from Vendor's standard samples. Main entry insulated fibreglass door(s). Front entry doors with brushed metal grip set and dead bolt lock. 7" colonial baseboards, painted white throughout with doorstop to tiled or laminate floor areas. 2 3/4" casings painted white on all doors and windows thoughout finished areas. Colonial-style interior doors, except where indicated as closet sliding doors (as per plan). Doors and windows to be trimmed (as per plan). Low maintenance Low-E Argon filled vinyl casement windows at front, rear and side elevations (as per plan). Sliding patio doors with thermopane, tempered glass with screen. 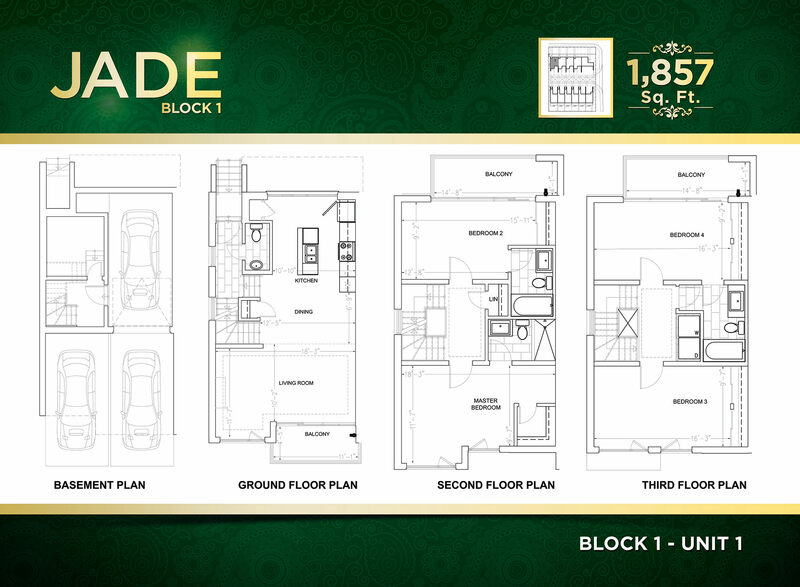 Spacious walk-in closets (as per plan). 100 amp electrical panel with circuit breaker. Light fixtures provided throughout, except living and dining room where a switched outlet is provided. Capped ceiling outlet is provided in the dining room, (as per plan). Decora® style light switches, plugs and switch plates. Split electrical outlet for stove and dedicated electrical outlet for refrigerator, washer and dryer. Electrical outlets near vanity in all bathrooms and powder rooms protected by ground fault interrupter (GFI). Programmable thermostat for optimal energy savings. Electrical outlets as required by code. Pre-wiring for one telephone outlet and one RG6 coaxial cable TV outlet, location per Vendor. Two (2) exterior electrical outlets, location per Vendor, both with ground fault interrupter (GFI). Separate electrical outlet on garage ceiling for installation of future garage door opener. Electrical outlet installed for future central vacuum system in garage. Ceiling concealed multi-split HVAC system that controls individual floor temperatures with remote control, includes air purifying system. Saves 30% energy costs. Heat Recovery Ventilator (HRV) for improved air quality. Rough-in for security system (location may vary). All plans, elevations and specifications are subject to modification from time to time by the vendor according to the Ontario Building Code (OBC), National Building Code and Architect. The Vendor will not allow the purchaser to do any work and/or supply any material to finish the dwelling before the "Home Closing Date"
House types subject to final approval by the municipality or developer's architectural committee and final siting and approval by the Vendor's architect. The purchaser shall indemnify and save the Vendor, its' servants and agents, harmless from all actions, claims and demands for upon or by reason of any relatives, workmen, and agents, who have entered on the real property or any subdivision or which the rear property forms a part of, whether with, or without authorization, express or implied, by the Vendor. Variations from Vendor's samples may occur in finishing materials, kitchen and vanity cabinets, floor and wall finishes due to normal production process. Purchaser's choice of interior colours and materials to be chosen from the Vendor's standard samples if not yet ordered or installed provided that the colours and materials are chosen by the purchaser within 10 days of notification by the vendor. Otherwise, the vendor reserves the right to choose the colour and/or materials. The Vendor is not responsible for shade difference occurring from different dye lots on all materials such as ceramic tile or broadloom, roof shingles, hardwood flooring, wood stairs, railing, kitchen cabinets, countertops or exterior materials. Colours and materials will be as close as possible to Vendor's samples but not necessarily identical. Purchasers may be requried to reselect colours and/or materials from the Vendor's samples as a result of unavailability or discontinuation. The terms and conditions as set out Schedule "B" to the Purchase Agreement shall apply to this features list. Prices and specifications are subject to change without notice. Vendor has the right to substitute materials of equal or better value. A wide variety of upgrades and options are available. E.& O.E. November 2015. Each home at Richmond Towns, by Ideal Developments is equipped with Sustainable Features that will help save money on monthly utiliity bills while delivering a home that is quality constructed while providing a healthier lifestyle for your family. 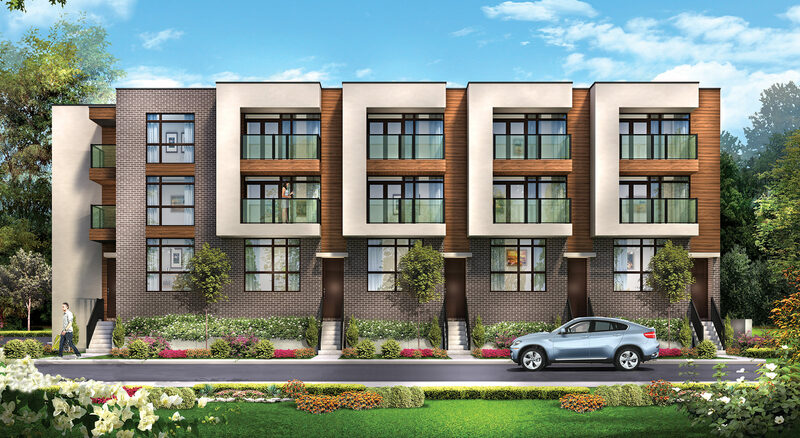 Located in Richmond Hill, Richmond Towns is a pedestrian friendly community in close proximity to GO Transit and Viva Rapid Transit. 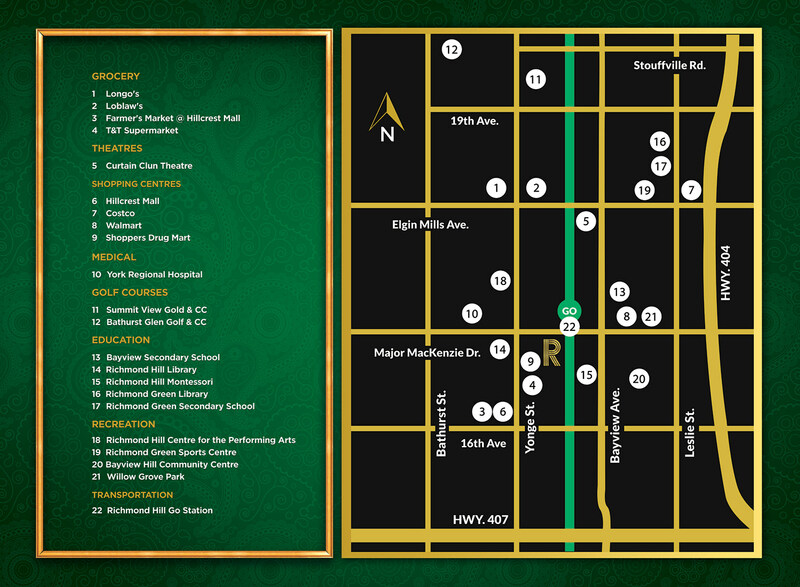 Other amenities nearby include restaurants, entertainment, grocery stores, coffee shops and many big box stores. Each home comes with drought tolerant sod, which means you spend less money watering your grass and your family can enjoy fresh, green grass longer during warmer weather. Main entry door(s) feature impressive steel doors with thermal insulation to reduce heating and cooling energy consumption. Low maintenance Low-E, Argon filled vinyl casement windows at front, rear and side elevations (as per plan). Heat Recovery Ventilator provides heating and cooling, while delivering fresh filtered air throughout the home and continuously re-circulates that fresh air for improved ventilation, air quality and comfort while reducing energy costs. Interior paint specially formulated to resist mildew growth in humid areas such as bathrooms and laundry rooms.